As if surviving a life-threatening delivery isn’t enough, you are keen to jump back to your routine at warped speed post-partum. You are too restless, all the while thinking that you are back to your usual self. Perhaps nobody’s around to lend a hand, and you’ve got to fetch some supplies at the nearby grocer. How long after giving birth is it safe to drive? New mom, cut yourself some slack and rest. You might be growing impatient and feeling useless, but you’ve got to recover. Two weeks is the minimum healing time wherein you must not lift, or clean the house, or run around and drive. Two weeks is too short and is only applicable for women who are strong enough to be released home within 24 hours after vaginal birth. If you had a vaginal birth, your muscles had been pulled and stretched big time. It is aptly called “labor” because you have exerted unusual strength just to push baby, a feat that no male can ever have done. Add to that the unforgettable pain plus emotional roller coaster; it was indeed a tough act to recover. You will be prone to possible tearing and numbed nerves. It will take weeks to get that feeling back down there. Your nerves are all jagged, and your driving reflexes are still compromised. So that explains the two week’s minimum recovery time before you can go back and drive your wheels. If you’ve got to stay at the hospital a bit longer, probably you have to be monitored due to a health condition. Longer hospital stay means you are more sensitive and need more rest. If that’s the case for you, two weeks is not enough. Make it three or four weeks. 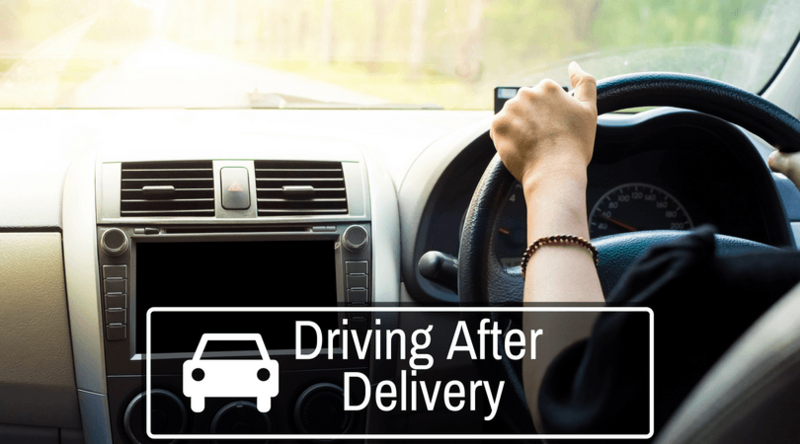 Don’t cheat and don’t skimp on those crucial rest weeks.A lot of mothers who have undergone C-section delivery might think that I am exaggerating with that four weeks rest time before driving. That’s because you have gone through a major surgery and had lost a big bucketful of blood. It was not just your tummy that was spliced open but also your uterus so yes, you got two large wounds to heal. We also know how painful and nasty those stitches can be. Just a bit of laughing or sneezing and it feels like you might spill out your intestines. Imagine how painful it is to do a sudden brake. Add to that the force that your foot got to exert, especially if you are driving a stick shift. It will be awful and unsafe to drive before your stitches are fully healed. If the stitches are still fresh, you might risk dislodging it. There will be blood. You will have no choice but to go straight to your doctor for some re-stitching and incision wound care. Delivering through C-section is no small feat, so give yourself more time to recover. I might sound like a nagging old lady, but based on my experience, some moms can be stubborn. It’s as if they have forgotten the fact that they have survived childbirth. It takes time for the body to heal itself. Even if you are healthy and athletic, healing doesn’t happen in a day or two. So might as well let nature take its proper course and wait for a few weeks’ time. The ordeal that women go through giving birth is not for the faint of heart. So rest if you must and enjoy the precious time you have with your newborn. You need it, you’ve earned it! Do it for yourself; you need to heal completely and be healthy for your baby.